The biggest occasion in the 45 year history of Lisburn Young Defenders Flute Band is now only a matter of weeks away. On the first weekend in September, thirty members of the Band will perform in the newly-named SSE Arena at the Belfast Tattoo. Although the band has performed at the Ulster Hall and a number of other sizeable venues in the past, none will compare to the atmosphere in the old ‘Odyssey Arena’ in front of a 5,000 crowd. 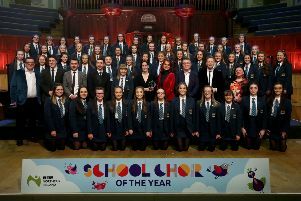 Only two other melody flute bands have performed at the Belfast Tattoo and one, Brookeborough, will be back again this year to accompany the Lisburn band in a number of pieces. The headline act this year is H.M. Royal Marines, and it is the first time that they have appeared at the show. The Royal Irish Regiment Pipes and Drums, along with bands from Canada and the Netherlands will add to the variety on show and the 2015 Tattoo is set to be the best yet. For Lisburn Young Defenders to appear on the same stage is an honour for the band and a credit to the hard work put in by all the members. To perform at the Belfast Tattoo requires a high level of musical ability along with the ability to entertain. Style and appearance is of massive importance as the Band will be ‘in the spotlight’ literally, and every move will be viewed, and in many cases recorded. Over the last number of months the band has had to develop their performance in both music and movement and at the moment are practising three times a week to put the finishing touches to the display. The Young Defenders will be on the Arena floor on three occasions- a slot where they will play on their own- a joint performance with Brookeborough - and the finale, where they will play alongside all the other artistes, with Auld Lang Syne sure to bring the house down. It is a once in a lifetime opportunity for all the members of the local Band and one which they are grabbing with both hands. Lisburn Young Defenders will play at all three of the shows, with the Friday and Saturday evening shows almost sold out. There are still some tickets for the Saturday matinee performance left. Membership of the band is still open and new members will be made most welcome, and receive expert tuition. Speak to any member in person or message through Facebook.